Wallpaper tends to be pretty bland these days, fuelled by the design "experts" still preaching beige – because as we all know, bland sells better than a house with a personality installed. But if you’re not looking to sell your home and want to add a bit of colour to your room, there’s some great ranges out on the high street. 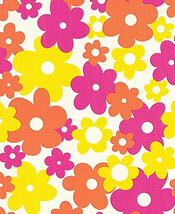 One that’s caught our eye is this Funky Floral design by Graham and Brown. The kind of big, bold flowers that would have adorned a 70s bedroom and a great way to make a statement in your home today. It costs around £17 per roll.